As I mentioned previously, many businesses and brands have turned to podcasting as a new communications channel for their marketing efforts. As the business of podcasting is still in its childhood (not infancy, but childhood) there are plenty of opportunities for both content producers and platforms to enter the playing field and make their mark. As the host and creator of the We Are Better Men Podcast, I went through the process of finding a suitable podcast host in 2017. 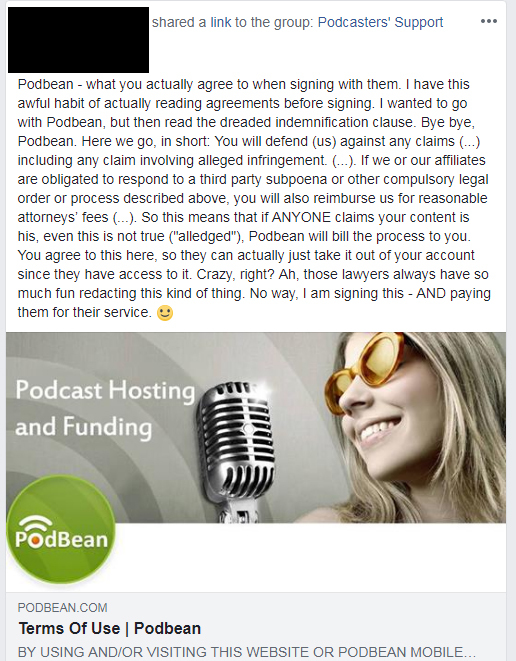 It came down to Libsyn vs Podbean, and eventually I decided to go with Podbean due to their pricing and relatively flawless platform. As a podcaster I find it critical to stay up to date with other podcasters on how they are effectively promoting their podcasts and producing them. So I join a Facebook group for Podcasters and started engaging in conversation. As you can see the potential customer is unclear and concerned with one of the lines in their terms and agreements before signing up. Now before I post this next move by PodBean, you should know that PodBean is not a “tiny” company. They have literally thousands of podcasts hosted on their platform and deal with tons of customer support inquiries (I am imagining this from my experience, know that I am no way affiliated with them and they are not giving me a discount for this post! — though if you guys reach out and would like to that would be superb 🙂 ). The Communications Director at Podbean is obviously also a part of these groups and paying attention to what potential customers and current customers are saying about both them and their own podcasting platform. This is seriously brilliant customer service. Many of us monitoring brands and companies online presence want to be able to interact with customers like this but aren’t always empowered to do so. Brands that are excelling on social media are. It’s something to think about and if you have team members who are capable, empower them to do so. This was a great example of excellent customer service in 2018. This is public, this was seen by hundreds and will continue to be seen by even more interested in the business of podcasting. It is a win win for the company.